This is our first episode of The Walking Dead where Carl is no longer a part of this world. For CarterMatt this is going to be a very different show. Even if Rick tries to fulfill his promise to his son and find a way to stop the killing and work towards a better future, not everyone else will be ready to move in that direction and some people will never be on board. The last scene in Carl’s utopia has Negan in a garden smiling and planting tomatoes – it’s a nice idea, but a man like that thrives off power, not fresh produce. The biggest cliffhanger was seeing Rick bleeding out while leaning up against a tree full of hanging stained glass. People are worried that Rick is going to die, but for us what that finale shot signified was that Rick was trying to fulfill his pledge to Carl (presumably by fixing the stained glass in the church that Carl died in) and found himself in trouble. We don’t think that Rick is going to die and we don’t think that this is going to make Rick give up on his promise to Carl. If Carl died as the only character looking at the bigger picture and then Rick who’s trying to pick up the torch also dies, then what’s the point of this show? Have we just been watching tortured souls killing each other for no real future and this is as good as it gets – because we don’t know about you, but we want to see everyone in a better place then where they all started. They don’t all have to be holding hands with Negan picking tomatoes, but it’s gotta be better than just surviving. Michonne was of course heartbroken, but also angry that not only was Carl dead, but also much of Alexandria was pretty much burnt to the ground. Their house was still standing and watching her see Carl and Judith’s hand prints on the front porch kicked her right in the heart. Her and Rick grab their stuff and head out, but this whole sequence re-connected us to Michonne in a way that we haven’t felt in a long time. Especially as she watched the sign of “Welcome to Alexandria – a safe zone” in the rear-view mirror and seeing in that one moment how much she has changed from when we first met her. Alexandria was a chance for her to be less of a warrior and see a side of Michonne where she felt grounded for the first time in a long time. Now that he’s not stuck in a compound full of walkers anymore Negan is trying to regroup with Simon. Unfortunately they are not seeing eye to eye on what the next move is. Negan wants Simon to get Jadis’ group in line even though she betrayed them, while Simon is starting to think that this group of people (and Hilltop, the Kingdom and Alexandria) aren’t taking to Negan’s lessons anymore. Simon’s suggests that they wipe them out and cast the net further out to grab other communities and use them as resources. Negan being a man that never wants to waste a resource thinks wiping everyone out is a giant waste and that there has to be a way to make them fall in line… and that’s by killing Rick. He thinks that once Rick is gone, no one will feel empowered anymore, but when Maggie’s message to Negan shows up in the form of a coffin with one of his men inside, Simon feels even more strongly that Rick is not the only problem – especially since the man in side is one of Simon’s men from the outpost. After a fight with Negan, he manages to get Simon’s anger in line and do what he asks starting with getting Jadis and her people in line. Simon gets to the dump and takes all of Jadis’ guns, but he’s really just looking for a reason to kill everyone, so he starts provoking her, killing a few of her people until she hits him. It’s just the reason he was looking for and the Saviors kill everyone, but Jadis. Negan is not going to be happy about this when he finds out, but for now Simon has lied to him. 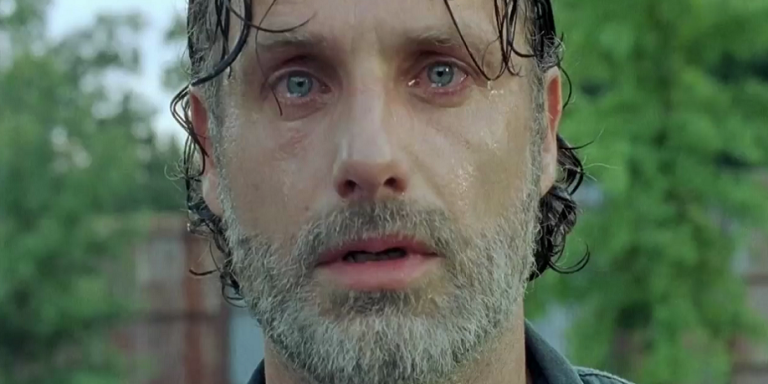 Has Rick changed through Carl’s death? We thought that Carl was pretty clear about what he wanted and what he was working towards, but Rick wasn’t 100% clear on what he was trying to say. Did Carl want Rick to surrender to Negan? Yeah Rick actually thought that for a moment and we realized that he’s so grief stricken that he’s not thinking clearly. When he goes to see Jadis and her people for help, he sees that Jadis is the only one left alive and everyone else is a walker. When she asks to come with him he says no and leaves her there – guess Carl’s death was all for nothing and Rick hasn’t learned anything. Carl has been dead for 12 hours and Rick is still leaving people for dead instead of building towards something more. This was such a huge disappointment. Michonne also felt disappointment in Rick’s choice and as much as Rick tried to explain that he didn’t want Jadis dead, that he just wanted her gone it’s still not what Carl was working towards, and Michonne reminds him of that. We of course have been dying to know what Carl wrote to everyone, but what seemed to surprise everyone was that he wrote a letter to Negan. For us that’s not too much of a surprise since Negan and Carl had a connection in some ways and Carl knows that if things are ever going to move towards a future where people work together, then Negan has to stop what he’s doing and look at things another way. Could Carl actually get through to Negan through death? After what Rick did to Jadis, he decides to take a moment and read the letter that Carl wrote to Negan and it seems that he has a better understanding of what Carl wanted. He contacts Negan through his walkie and tells him that Carl is dead. Negan isn’t affected by much, but hearing that Carl is dead is something that made him take pause and after hearing that he wrote Negan a letter asking for peace between all sides, he took another moment of pause. What was disappointing once again was that Rick basically said Carl wanted peace, but too bad because he still plans to kill Negan. Seeing Negan broken up about losing Carl and saying that he was the future was interesting, but this is Negan we are talking about, so his “future” would’ve probably involved Carl being Negan’s right hand man and not the utopia Carl wanted. Related – What’s coming up on episode 11? Here’s a hint it’s going to heavily involve Norman Reedus! We thought that with such a major character death there would be a lot more focus on how everyone was dealing with it. Instead we had some at the beginning of the episode with Michonne and then it was back to business as usual with Negan’s war to get everyone under control. The most disappointing part of this episode was seeing that so soon after Carl’s death Rick was still leaving people behind. We understand Jadis isn’t the greatest person alive, but his reasoning for leaving her “we don’t need her” was the typical Rick attitude that we’ve come to know – the mindset that Carl was practically begging him to change right before he died. Right now it feels like Carl’s legacy is where Rick left Jadis – in the dump. What did you think of The Walking Dead season 8 episode 10? How does the show feel now that Carl is actually gone from this world? Leave us a comment in the box below with your thoughts.